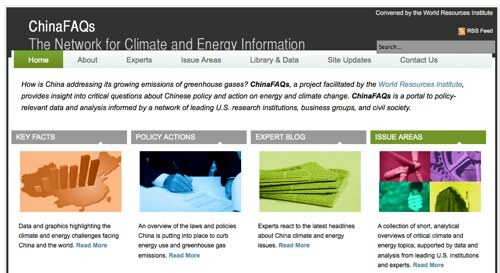 The World Resources Institute yesterday released a new English-language Web site, ChinaFAQs.org, dedicated to answering questions about climate change and energy in China. The easy-to-navigate online resource so far lists the bios and contact information of 26 experts, including nonprofit leaders, academics and scientists, who are available to offer commentary and analysis about a range of issues. The “Transportation” section of the site still lacks an associated expert voice, but in the meantime, you can download a PDF about “China’s Transportation Revolution” under the “Library & Data” tab. There’s also a paper on “China’s Fastest Growing Cities,” about rapid urbanization in the country, and another, titled, “‘Two Chinas’ Shape Climate Views,” about the stark contrasts between rich urban populations and poor rural communities. ChinaFAQs is a project facilitated by the World Resources Institute that provides insight into critical questions about Chinese policy and action on energy and climate change. The ChinaFAQs network is comprised of U.S.-based experts and partner organizations, including researchers at U.S. universities and government laboratories, independent scholars, civil society organizations, and other professionals.